Miyama had us smitten from the start. Using organic ingredients from their garden in Dalat, their desserts have less sugar and doesn’t use and artificial colouring. So all the colouring in the desserts and food is natural. This allows you to indulge in their yummy desserts without the guilt. 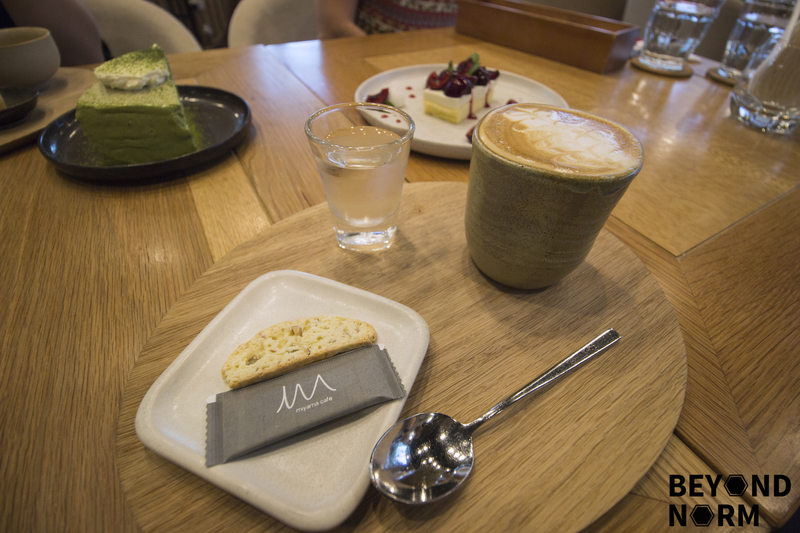 It’s been one year and half years since the opening of this specialty dessert café, and they have constantly been revamping their menu to better suit their customers. So don’t be surprised if the desserts that we mentioned are no longer available! 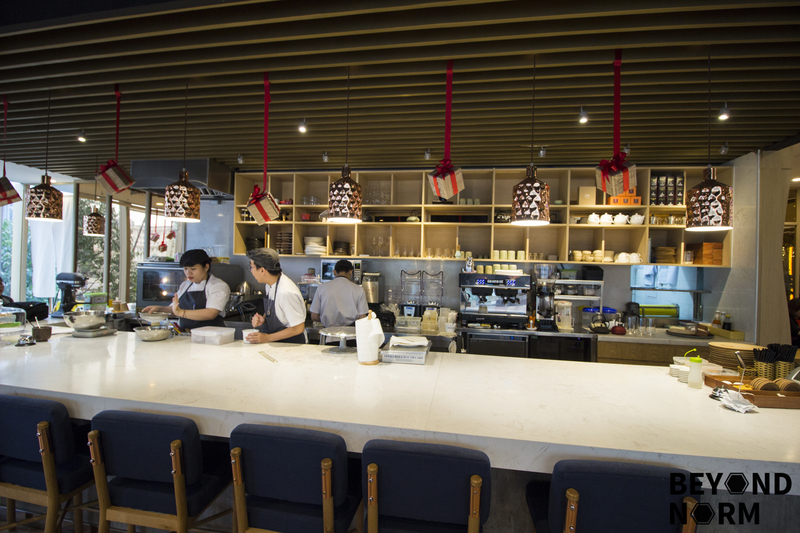 The café is a modern Tokyo-styled café based in the centre of the bustling city of Saigon. The glass panes that encloses their minimalist space casts plenty of natural light into the café whilst providing you with a sense of escapism from the urban city. It is a rather tough gem to find as it is not located on the same floor as the rest of the eateries. 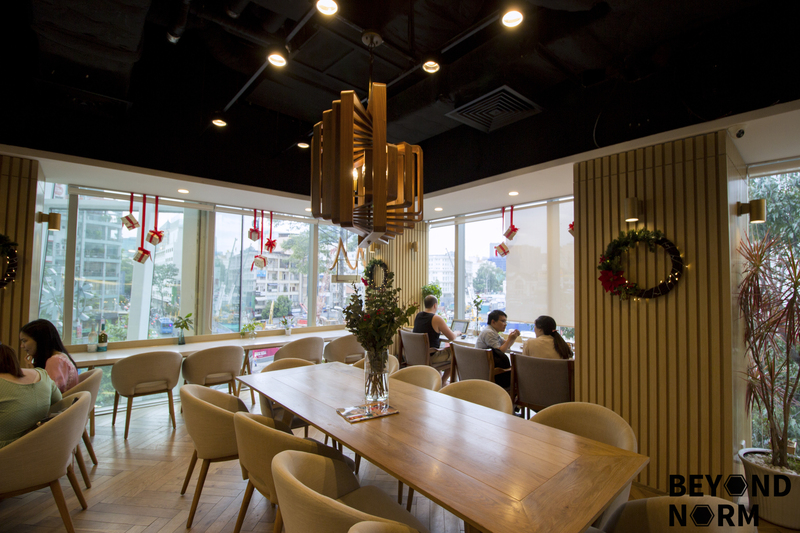 It is situated on the 3rd floor, in the corner lot of Saigon Centre, right next to Levi’s. 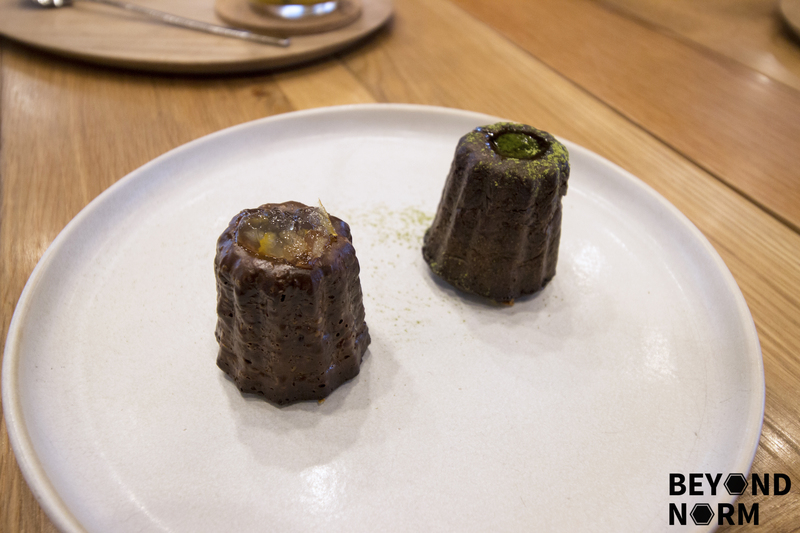 First, we have the Canele from the Freshly Baked Sets (148,000 VND). These sets are baked from 3PM to 6PM, and come with a choice of coffee or tea. Some aspects of the sets changes daily, but the flavours that we got were Yuzu and Green Tea. The French pastry was nicely caramelized and crusty on the outside, and yet soft and flavourful on the inside. Personally, I found it to be a pleasant surprise as I liked it a lot more than I expected to. Miyama has an array of healthy drinks and we decided to order the Organic Can Gio Mango Frozen (98,000 VND). Right from the get-go, you could tell that it was house-made and fresh. The texture resembles a mango purée, and the mango flavour is strong and sweet with very little sugar added. 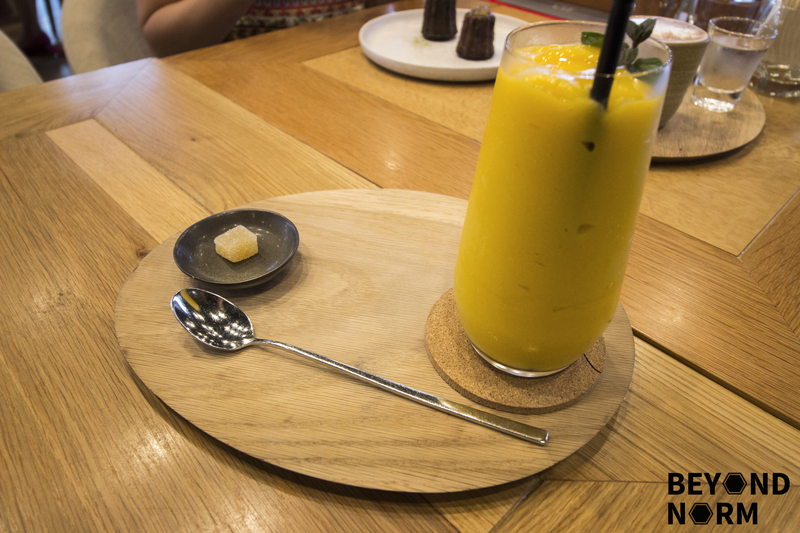 If you love mangoes, this might be the drink you want to order. Another beverage that we ordered was the tea, La France (148,000 VND). It was fragrant and smells a lot like a Fuji apple. In terms of flavour, it has a tinge of sharp minty-ness that went well with the light apple flavour. However, you might want to drink this while it’s still hot as that’s when it tastes best. We also didn’t enjoy it when the tea brewed for too long as it had a very tannic aftertaste. Next up, we had their Cherry Slice (108,000 VND). 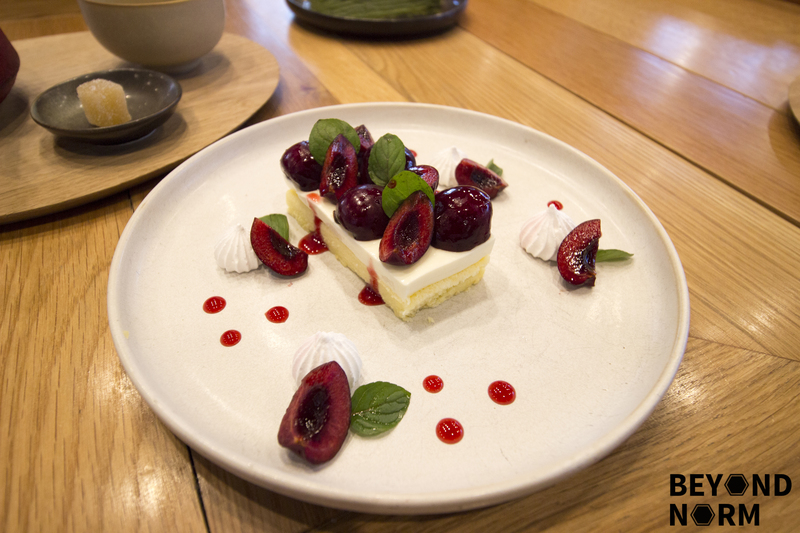 It was garnished with fresh cherries, tiny meringues and some mint. Over all it was light but creamy. In addition to that, the mint leaves gave the dessert another dimension. It’s slightly sweet but not too overpoweringly so. Definitely a well thought out combination of flavours! We also ordered the Hồ Con Rùa Plated Dessert (158,000 VND). This was honestly almost to pretty to eat! There’s a lot of elements to this beautifully plated dish. It’s very complex with the different layers of textures and flavours. 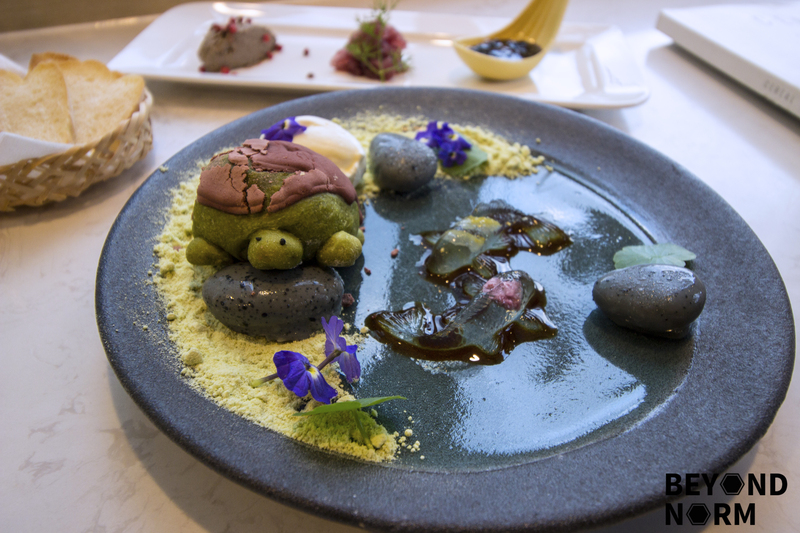 Each component of the dessert has different flavours. My favourite part is that everything on the plate is edible. The “pebble stones” were delicious chocolate on the outside, with yuzu cream on the inside. The turtle bun is a bit flour-y but when eaten with the cream, it balances out well. The cute little Koi jellies were filled with Sakura and Yuzu. I had no idea that Sakuras had a slight tinge of a taste that resembled sour plum! Of course with all the sweets we ordered, we needed a bit of savoury! We ordered the Chicken Liver Pate as an intermezzo for our desserts. It came with a side of raspberry jam, red wine onions, and pink pepper from Phu Quoc Island. Fun fact: These pink peppers are unique to the island! I especially loved the pink pepper as it has the peppery fragrance and light flavour but isn’t overpowering. The pate was homemade and oh-so-delicious! 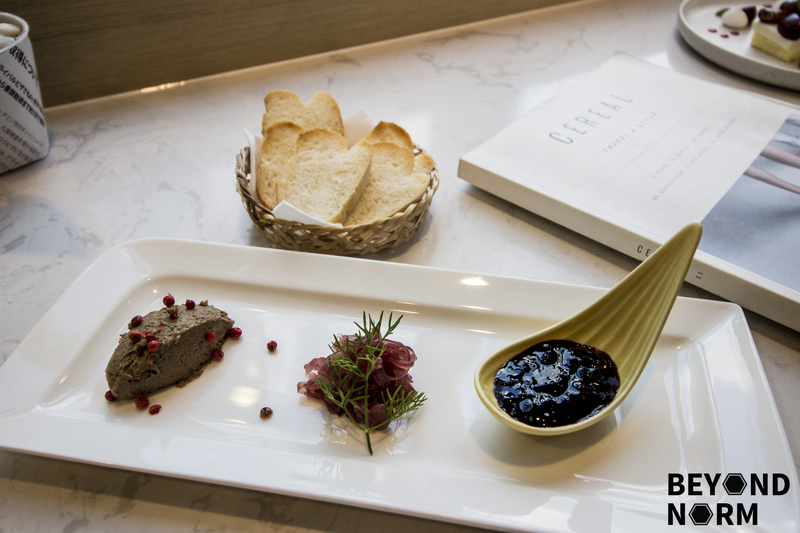 Overall, the pate was great to cleanse the palate as it was savoury and a nice change of flavour. 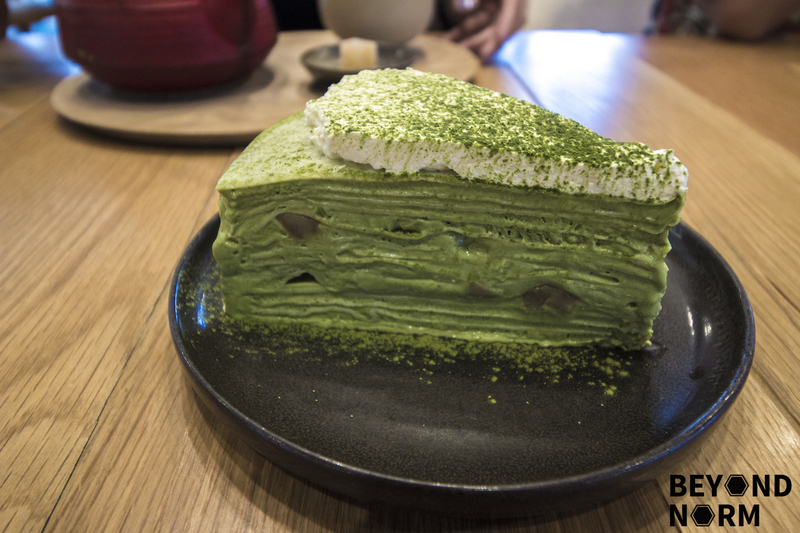 What is a trip to a Japanese Specialty Dessert Café without ordering the Matcha Millecrepe. The millecrepe was creamy and had a full-bodied matcha flavour. The crepe isn’t too flour-y as it was just the right thickness nad there was a good scattering of red beans to go with it. This is definitely one for the matcha lovers.